Welcome to The Hall of Blue Illumination, a podcast dedicated to M.A.R. 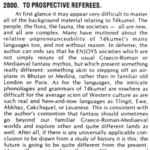 Barker’s world of Tékumel. In this episode, our hosts discuss straightforward ways to begin running a campaign in Tékumel. We end with commentary on the Five Hlimékluyal (Cohorts) of the Gods of Stability. [00:00:55] As Scott stated in Episode 7, Tékumel’s setting preceded Empire of the Petal Throne the game, unlike Dungeons & Dragons, where the game came first, and its setting was created and applied later. [00:02:16] First piece of advice, make Tékumel your own. Don’t be afraid to diverge from published history or setting information, or make it up as you go along. [00:02:51] When beginning a game set on Tékumel, an important first step is to decide where you want to start your game. It doesn’t have to be in Jakálla. [00:03:24] One reason James chose to set a campaign in Sokátis is that it’s similarly situated to Jakálla. Both are on the edges of the empire, and thus conveniently placed for “fresh off the boat” campaigns. Khirgár or Thri’íl are good for this too. [00:04:17] Each city has a flavor to it. Let the aspects of Tékumel on which you want your campaigns to focus guide your location choices. [00:04:45] While it’s traditional to set your campaign in or around a city, you don’t have to. Take, for instance, a campaign set in Jánnu or Kilalámmu. These places are very different from Tsolyáni cities. [00:06:00] Your players could also be part of an exploratory expedition. [00:06:30] On a ship, players might encounter lost Engsvanyáli colonies, or echoes of the Wars of the Latter Times. [00:07:01] Once you’ve chosen a place, next ask yourself, “Who’s there?” Even where the official material is silent, nonplayer characters are easy to devise. [00:08:30] In his games, James attempts to give every nonplayer character a name, because this gives weight to the encounter. A one-off nonplayer character can be later fleshed out and set up in a subsequent encounter to give the players a bit of depth. [00:11:00] Suggestion: for every character who has an interest, create a nonplayer character with a competing interest. This adds complexity; it means that the ramifications of players’ choices are rarely simple. [00:11:45] The chart in EPT § 1110 (pp. 40-41) provides a way to create nonplayer characters. Victor suggests rerolling on this chart to create a second nonplayer character with opposed interests as well. [00:12:31] While you can certainly play Tékumel (and EPT) like D&D, at some point the depth of the world is going to make itself known. [00:13:08] There’s an abundance of advice online about starting a campaign on Tékumel. James explains his use of index cards in session preparation. Analog methods of recording and manipulating data get you away from the computer and help you focus. [00:15:00] After you people a location with nonplayer characters, all you need is an opening scene to get started. From there on, you can use your players’ decisions to drive the narrative. Listen to your players. [00:16:42] Second, make and review notes after each session. [00:16:49] James offers a suggestion based on his Strange (non-Tékumel) campaign. He gave his players a journal where they take turns keeping track of sessions. At the beginning of every session, he asks them to recap the events of the previous session. [00:18:45] We’d love to hear about your experiences running Tékumel. By sharing your ideas, we all discover more about what makes Tékumel special. [00:19:55] Drá, Cohort of Hnálla and several interesting bits of theology. [00:21:42] Chegárra, Cohort of Karakán. Not just the expression of war as a noble activity, but war in the service of society. [00:22:30] In many ways, the “war gods” (viz. Karakán, Chegárra, Vimúhla, and Chiténg) have more in common with one another than the other gods of their respective alignments. They often form their own faction. [00:25:49] Keténgku, Cohort of Thúmis. The Cohorts represent “the sphere of their primary deity applied” or the social application of their gods’ portfolios. For example, while Thúmis is concerned with wisdom, Keténgku is about what you do with it. [00:27:45] Dilinála, Cohort of Avánthe. Some portion of Dilinála’s aspects appear to verge into those of Dlamélish. Contemporary Tsolyáni views of the Engsvanyáli classifications of the gods and their interests suggests a more complicated past. [00:28:42] When considering Tsolyáni religion, it is crucial to remember that Pavár’s classification is a reduction of the actual reality of the gods. [00:32:16] Belkhánu is the god of the soul cycle and the planes of the afterlife, but Qón protects souls in transit and acts as a guide to those who traverse the planes. [00:33:12] Keep in mind that EPT only gives brief descriptions of the gods. Mitlanyál explains that all of the gods have multiple aspects. Flamesong, Professor Barker’s second novel remains out-of-print, but is easily acquired through online used booksellers. The Tékumel Foundation plans to reissue it in print and electronic versions in the near future. Mitlanyál is an in-depth exploration of the religious practices of the Tsolyáni in two volumes. It was published in 2004 by Zottola Publishing and is currently out-of-print. The Strange is a contemporary roleplaying game where players move through multiple alternate dimensions. I have been running an EPT play by post campaign at the following link. It has been a bit challenging to keep the game going, but I have 2 dedicated players at the moment. I agree that doing prep away from the computer is best, but I find that organizing a campaign on a forum with various threads can be beneficial.